As Brazilians fight against corruption and cronyism, one Supreme Court judge insists on doing things the old-fashioned way. This piece has been updated and corrected. Brazil has a long tradition of politicized courts. But even in that context, Brazilian Supreme Court Judge Gilmar Mendes is unique, as he is both as an extreme manifestation of this tendency and a revealing case study in what this tendency means for the judicial system and the country. Consider: the senior 61-year-old judge counts the country’s most powerful politicians, including the president, among his close friends. His close and regular contact with them continued even as some of them faced serious allegation of corruption – and even though, as a member of the Supreme Court, cases involving them could fall under Mendes’ jurisdiction. He negotiates with politicians, promises and delivers support, receives them as guests at home and attends their dinners – in presidential receptions, for example, the judge is an habitué. As the most controversial member of the 11 judges of the Brazilian high court, he has drawn the wrath of the country’s corruption fighters and is poorly regarded by 84 percent of Brazilians. Three years into the wide-ranging Lava Jato corruption investigation, which has landed some of the country’s top political and business leaders in prison, the judge’s decisions are under daily scrutiny. His rulings and statements make headlines regularly. This is particularly true of key decisions related to corruption and to Lava Jato – an investigation that has broken new ground in Brazil, where the powerful have seldom been made to pay for their crimes, said Silvana Batini, a professor of constitutional law at FGV in Rio de Janeiro. The pressure has done little to change Mendes, who has continued to rule in cases involving his “friend of decades,” President Michel Temer, and other pals – whatever the cost to Brazil. Mendes was nominated to the Supreme Court by former president Fernando Henrique Cardoso in 2002. He had to make a decision: taking the judgeship would mean abandoning his aspirations to become a politician, and keeping a safe distance from that world in order to preserve his impartiality. Mendes chose to not make that choice. He took the position, but over the last 15 years of public service, he has made powerful and loyal friends among lawmakers in the capital, Brasília. Many businessmen and influential public figures who had relationships with Mendes, such as President Temer or Senator Aécio Neves, who came in second place in 2014’s presidential elections, found those connections remained solid even after they were facing corruption charges. Mendes picked up the phone when Neves called, even when that call came in before an important debate on an abuse of authority bill was under way at the Senate. In a call intercepted by an authorized phone tap in May, Neves was very straight forward about asking the judge to use his influence to change another senator’s vote in an effort to weaken Lava Jato investigations. Mendes readily agreed to help. Critics say Mendes is a key ally of Brazilian elite. In a heated debate in court, judge Luis Roberto Barroso loudly accused him of being lenient with white collar criminals, and changing his decision according to who is the defendant. Barroso didn’t mention specifically which case he was referring to, but his outburst could apply to two recent events involving Mendes. The first, in April, concerns the ruling on the case of former Brazilian tycoon Eike Batista, who has been sentenced to house arrest in his luxury mansion in Rio de Janeiro. Mendes, who is a friend of Batista’s attorney, interpreted his crimes as not representing a threat to others, which, in his reasoning, eliminated the need to keep him incarcerated. Then Prosecutor General Rodrigo Janot recommended Mendes abstain from the case. He did not. Federal prosecutors accuse Batista, former governor of Rio Sergio Cabral and seven others of facilitating graft and hiding illegal funds in offshore shell companies. Similarly, Mendes’ decision to release Rio’s transportation mogul, Jacob Barata Filho, from jail in September has been widely condemned. Mendes was the best man at the wedding of Barata’s daughter, and he is the brother-in-law of the groom’s father. 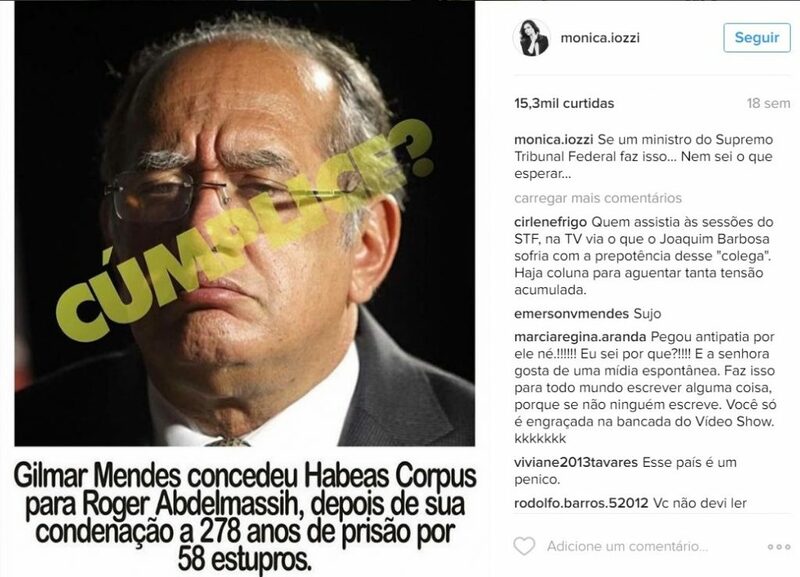 According to former Prosecutor General Rodrigo Janot, these close familiar connections should have given Mendes reason to recuse himself from the case. Instead, the judge reacted by calling Janot “the most unqualified prosecutor in history” and decrying his criticism as slanderous. In his defense, he argued that the interpretation of what constitutes friendship is subjective. Then he made the court dismiss the prosecutor’s request for him to be recused from ruling the case and proceeded to free his friend from jail not once, but twice. Instances like these, in which Mendes publicly sides with friends involved in cases under his review, illustrate the damage Mendes does to the judicial system, said Batini. “This obviously has an impact on the image of the judiciary,” she said. The Barata case was the eighth time the judge was asked to recuse himself. No judge in the court’s history has been told to drop a case more often. Mendes has also has been the subject of two impeachment procedures, one of them a result of an online petition with nearly 900,000 signatures. Because of his position, Mendes often plays a key role in important decision-making processes that significantly impact the nation, such as the impeachment procedures or graft investigations involving high-level businessmen and politicians. But the once widespread feeling among Brazilians that the judiciary was somewhat less tarnished than politicians seems to be dissolving as tolerance for behavior like Mendes’ is diminishing. A survey from 2013 reported that 54 percent of Brazilians trusted the Supreme Court, and this year, another poll found that only 24 percent were confident in the judicial system as a whole. The cover of the conservative national magazine Veja’s August issue was Mendes’ face under the headline: "The Judge Who Disagrees With Brazil." Regardless of criticism from the press, social media or even his peers, Mendes remains untouchable, moving with ease from the judicial sphere to the political world, and shrugging off allegations of inappropriate behavior. A previous version of this article incorrectly stated that 24 percent of Brazilians approved of the Supreme Court's decisions. The figure refers to confidence in the overall judicial system. This piece was also updated to add in words that were dropped in an editing error. Mendonça is a Brazilian journalist.